Nissan is bringing gas-free car technology to the United States starting around December of this year. 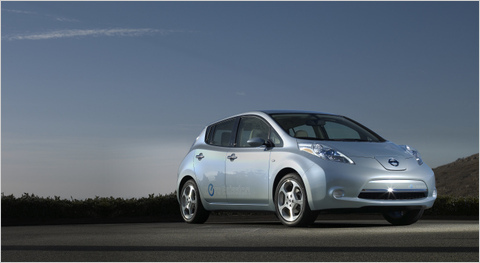 The highlight of Nissan’s 2011 model year is the Nissan Leaf. Not only is it a sport little four-door hatchback, it’s also going to be Nissan’s first gas-free car. That’s right, it’s that long-awaited plug-in electric car, and it’s expected to start a price war. The Leaf will retail for about $25,000 after a $7,500 government rebate, putting it well within the price range of most of America. The low price, and its $349-per-month leasing option, makes the Leaf a competitor to the Chevy Volt in spite of a lack of backup gas engine. Will America embrace a car with only a 100-mile range? Doubtful. While that’s definitely good enough for the daily drive, America is a country that loves its road trips. I doubt gas stations will let you plug in your car for several hours while you wait. While the Leaf gets more charge in its batteries, it also requires 8 hours of charge time on a 220-volt line; the Volt requires only 8 hours on a 110-volt circuit, or only 4 on a 220 line. I can’t overstate the value of Chevy’s backup generator engine technology enough.